Arjun, the archer par excellence, owing to his confidence in himself had never lost a battle before. But at the battle of Kurukshetra looking at the impending war with the members of his own clan stood in the middle of the battle ground with despair and ready to quit. At this moment ensued a dialogue between Arjun and his charioteer as well as dear friend- Lord Krishna. The dialogue took the form of the text Bhagavad Gita. It is to commemorate this pious text that, like every year, the state government of Haryana held the International Geeta Mahotsav (IGM) at Multipurpose Hall, Chaudhary Devi Lal University (CDLU), Sirsa, Haryana from 28th November to 30th November, 2017. The IGM hosted many competitions such as quiz, drawing, fancy dress, Rangoli, and Gita chanting. The IGM also held a section where various spiritual, cultural and social NGOs were given space for expression through exhibitions and stalls. 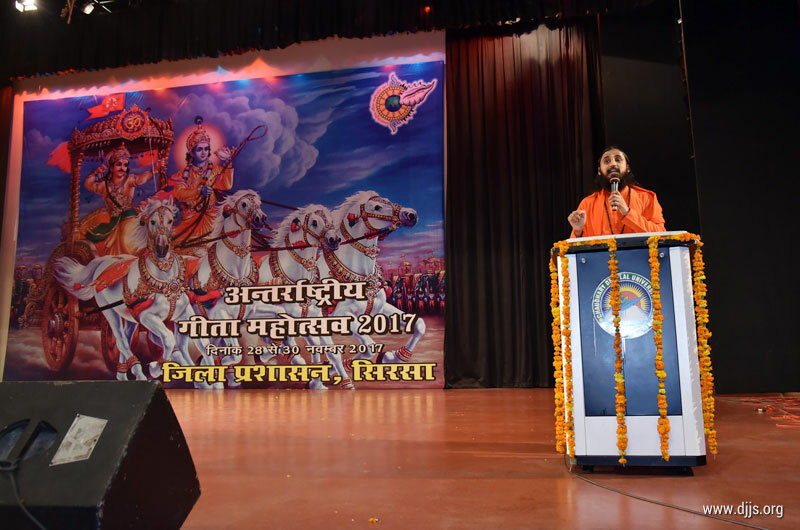 Divya Jyoti Jagrati Sansthan (DJJS) with the grace of His Holiness Ashutosh Maharaj Ji, founder and head of DJJS, garnered huge attention at the event not only because of its vibrant exhibition but also due to the lecture delivered by one of its nuanced orators Swami Vigyananad Ji. Swami Ji stated the essence of the text Bhagavad Gita in simple yet effective words. Swami Ji elaborated on the statement that Lord Krishna says to the hopeless Arjun in the Bhagavad Gita that whenever the decay of righteousness happens in the world, the supreme consciousness takes birth and restores righteousness. It must be noted here, said Swami Ji, that the supreme consciousness does not resolve the ethical imbalance of the world by performing actions on behalf of humans but rather by imparting the divine knowledge (Brahm Gyan) to them. The divine knowledge makes the fallen humans undertake virtuous deeds and change the world for the better. In this way, the supreme consciousness leads the human race back on to the path of an exemplary life. Lord Krishna was the supreme consciousness incarnate. He pulled Arjun out of his suffering by enlightening him with the eternal knowledge. In the process became his spiritual teacher (Guru); a teacher with whose guidance Arjun won the Kurukshetra war. Swami Ji asserted that today, like Arjun, we too need an enlightened seer in our lives so as to win over every kind of evilness. Swami Ji said that H H Ashutosh Maharaj Ji is one such enlightened soul who can enlighten any spiritual seeker. Swami Ji brought the lecture to a closure by presenting the book titled Ashutosh Maharaj: Mahayogi Ka Maharahasya by Sandeep Dev to Shri Nayab Singh Saini (Minister of State, Govt. of Haryana).